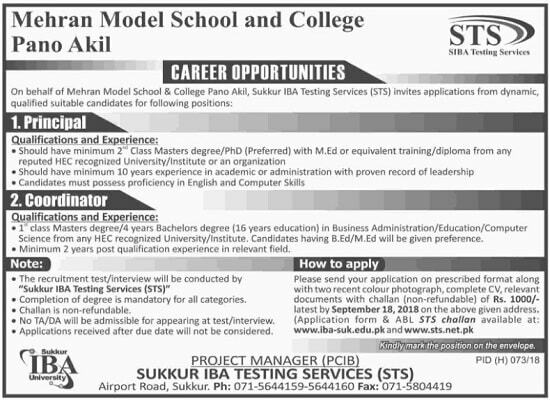 Mehran Model School and College Pano Akil Jobs through STS SIBA Testing Sevice Sukkur Apply Online. Qualifications and Experience: • 1′ class Masters degree/4 years Bachelors degree (16 years education) in Business Administration/Education/Computer Science from any HEC recognized University/Institute. Candidates having B.Ed/M.Ed will be given preference. • Minimum 2 years post qualification experience In relevant field. • The recruitment test/interview will be conducted by “Sukkur IBA Testing Services (STS)” • Completion of degree is mandatory for all categories. • Challan is non-refundable. • No TA/DA will be admissible for appearing at test/interview. • Applications received after due date will not be considered. Kindliinark the position on the envelope.